US Air Force/Senior Airman Joshua MagbanuaUS Air Force Staff Sgt. 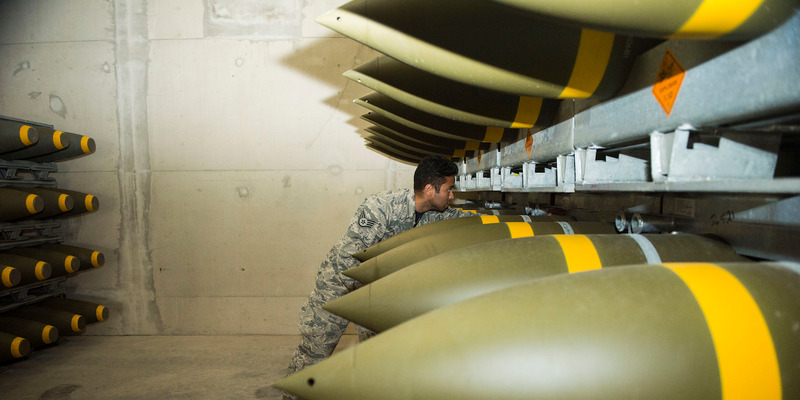 Jeric Hernandez, an 86th Munitions Squadron quality-assurance inspector, inspects a recent shipment of large ordnance at Ramstein air base in Germany, October 19, 2018. 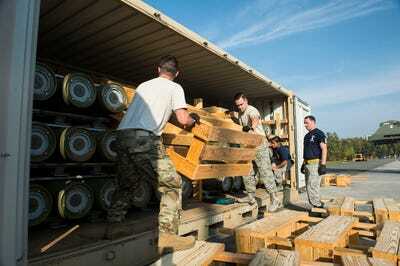 The 86th Munitions Squadron at Ramstein air base in Germany got about 100 containers of munitions this month. That’s the largest shipment of ordnance the unit has gotten since 1999. It comes as the unit, and NATO forces in Europe, increase their deterrence posture amid heightened tensions with Russia. Roughly 100 containers of a variety of weapons have arrived at Ramstein air base in Germany this month – the most munitions the base has gotten this century. Ramstein, opened in 1953, is the headquarters of the US Air Force in Europe and Africa and of NATO’s Allied Air Command. The base is part of the Kaiserslautern Military Community, which includes Ramstein and other, smaller bases in a rural part of southwest Germany. Nicknamed “Little America,” Ramstein and the KMC at large are home to more than 50,000 US military personnel and civilians, making it the largest such community outside of the US. Ramstein’s host unit is the 86th Airlift Wing; its commander also oversees the KMC. 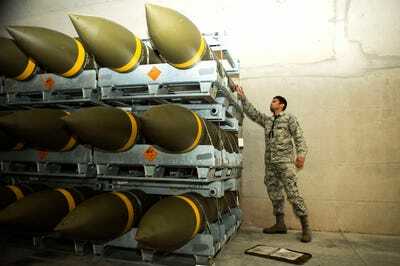 This month, the wing’s 86th Munitions Squadron took delivery of more munitions than it has gotten in nearly 20 years. US Air Force/Senior Airman Joshua MagbanuaUS airmen assigned to the 86th Munitions Squadron unpack a shipment of munitions on Ramstein air base in Germany, October 19, 2018. Operation Allied Force was the official NATO codename for the alliance’s 78-day bombing campaign against Serbian forces during the Kosovo War between late March and early June 1999. More than 1,000 NATO aircraft, most of which were from the US, flew 38,000 total sorties – 30,000 of which were conducted by US aircraft – during the conflict. Only two NATO manned aircraft were shot down: One of the Air Force’s vaunted stealth F-117 Nighthawks and an Air Force F-16 flown by then-Lt. Col. David Goldfein, who is now the Air Force chief of staff. Master Sgt. Arthur Myrick, the 86th Munitions Squadron’s flight chief, said the stockpile at Ramstein would be added to the Air Force’s War Reserve Material in Europe and would support the European Deterrence Initiative. The EDI, previously known as the European Reassurance Initiative, has funded military projects in Europe since the Russian intervention in Ukraine in 2014. The EDI is meant to “increase responsiveness and readiness by pre-positioning ammunition, fuel and equipment to enhance the US Department of Defence’s ability to provide a rapid response against threats made by aggressive actors,” the Air Force said in the release. Under the EDI, the US has already spent millions upgrading and expanding facilities in Eastern Europe and on Operation Atlantic Resolve, which includes US armoured rotations in Europe, a continuous presence in the Black Sea area, and the prepositioning of equipment and weapons on the continent. Ramstein – described as “a power-projection platform” by a US Air Force officer – has been a major hub for operations in Africa and the Middle East during the US-led war on terror. The record-setting weapon delivery this month underscored the squadron’s significant role in supporting US and NATO forces throughout its area of operations, Myrick, the squadron’s flight chief, said in the release.